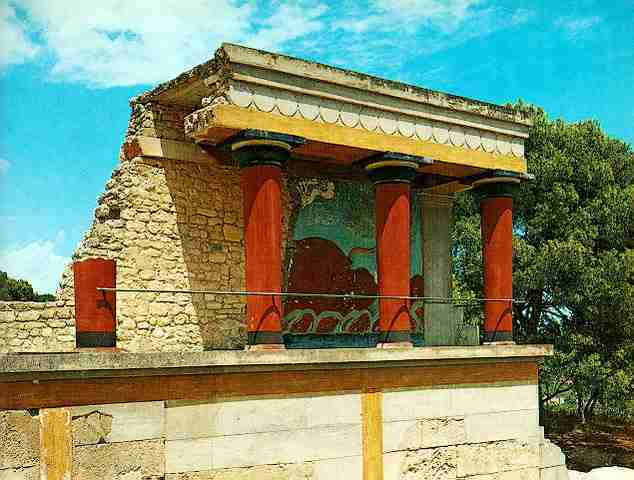 Minoan architecture was graceful, beautiful and colorful. Building materials were usually native stone and clay, with timber used for reinforcement. Columns were tapered, different from classical Greek and Roman columns. The cities were unfortified with paved roads. The windows were unglazed though there are a few windows fitted with thin semi-transparent alabaster. These would let in light, but could not be seen through. The palaces are multistoried with many rooms and passages, quite labyrinthine in character. They may well have given rise to the story of the labyrinth, the classical Greek myth about the minotaur, said to dwell in ancient Crete at the palace of King Minos. This myth is why we call this people the Minoans. Sir Arthur Evans, who first excavated the remains at Knossos, gave them the name, convinced that had found the origin of the myth. 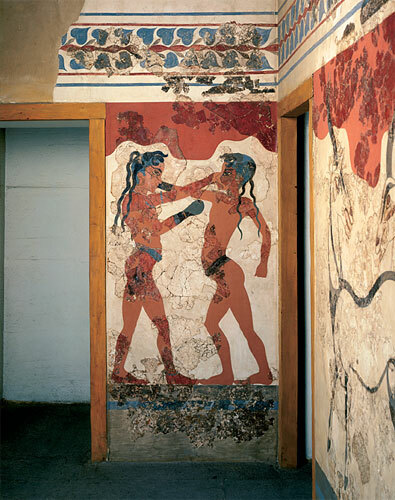 Walls were often covered with plaster and painted with colorful frescoes. The frescoes were painted by painting the walls while the plaster was still wet, so that the images were more or less permanently in the walls. 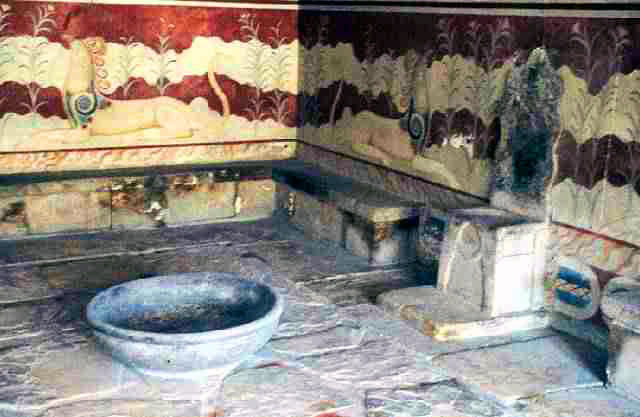 In addition to other major and minor architectural achievements, the Minoans were excellent engineers, and developed sophisticated systems for piping in hot and cold water, toilets and drains, and hypocaust heating systems under the floor.